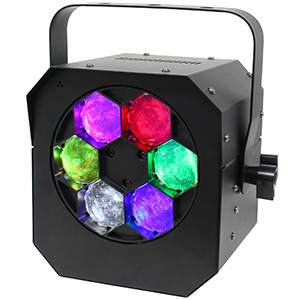 The new Mega Go Par64 Plus packs in 172 10mm, 0.07W LEDs (split across 56 Red, 60 Green and 56 Blue), which allows the fixture to generate potent primary colour washes as well as offer full RGB mixing to create a huge palette of mixed colours and shades. This is then enhanced by the inclusion, at the centre of the 10mm LEDs, of a single high-power 3W UV LED which allows for black-light effects as well as lots more colour mixing potential. 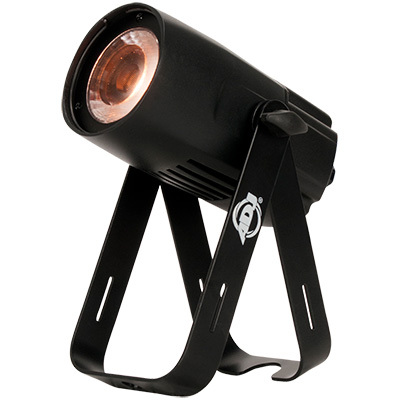 Also packed into the Mega Go Par64 Plus’s compact and lightweight unit is a rechargeable lithium battery that allows 4.5 hours of continual light output with all of the LEDs on full. This means that DJs can enjoy the flexibility of being able to utilize potent RGB+UV colour washes absolutely anywhere they want them, even if power sockets aren’t available. Then, after the event, just four hours of charge time is all that’s required to bring the battery back up to full capacity. 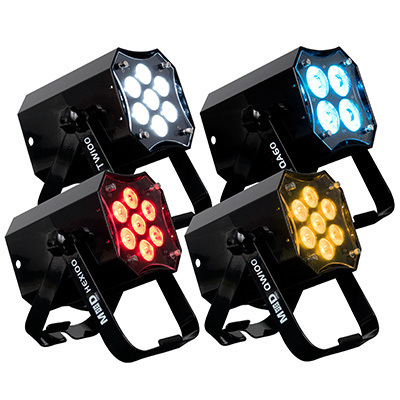 The new Mega QPLUS Go, meanwhile, utilizes five 4-Watt 4-in-1 RGB+UV LEDs. This fixture too can be used as a UV light-source to create the classic glowing effect when it hits white or florescent clothing. 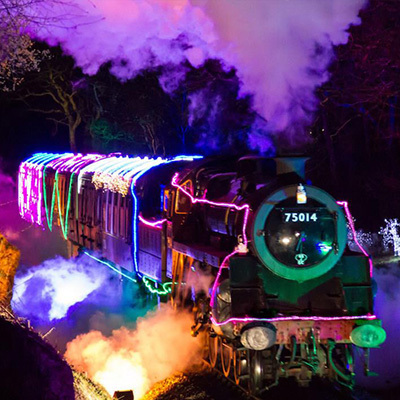 And it can also be used to generate RGB colour washes, as well as UV-infused washes to produce colours such as rich purple and electric pink, all shadow-free thanks to the use of integrated LED light sources. Also equipped with a rechargeable lithium battery, the Mega QPlus Go means that DJs can position these UV and colour washing effects literally anywhere within a venue, regardless of the availability of power sockets. The internal battery is capable of powering the fixture for 4 hours with full output, which can be extended to 5.5 hours using the Energy Saving Mode. Then, between events, four hours connected to mains power is again all that’s required to charge the battery back up to full capacity. In addition to their internal batteries, both units are also fitted with IEC power input and output sockets. These can be used to daisy chain together multiple fixtures for charging, or for events that require extended periods of continuous use above the capacity of the battery. If needed, these sockets are arranged to make running cables as simple and neat as possible. 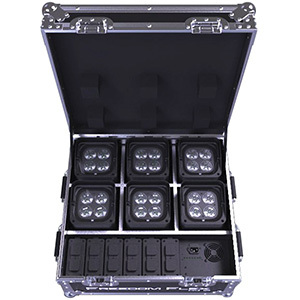 On each fixture, the power input - alongside the XLR DMX input socket - is located on one side of the casing, while the power and DMX output sockets are positioned on the other side. Both fixtures also feature a useful ‘sit-flat’ design, which means that they can sit directly on the ground, or inside truss, thanks to the rubber feet on their back panels and the convenient side-positioning of their power and DMX input and output sockets. Each unit is also fitted with an adjustable scissor yoke which can be used for conventional mounting to a truss or lighting stand as well as to create a variable-angle floor stand. Despite their powerful internal batteries, the Mega Go Par64 and Mega QPlus Go are both lightweight and compact, making them easy to store and transport. The Mega Go Par64 Plus weighs 2.2 kgs and measures 261 x 260 x 110mm, while the Mega QPLUS Go weighs just 1.9kg and has dimensions of 227 x 253 x 140mm. Both of the new units also offer a wide range of control options, making them equally suited for simple static-colour up-lighting as they are for integration into a full DMX-controlled lightshow. 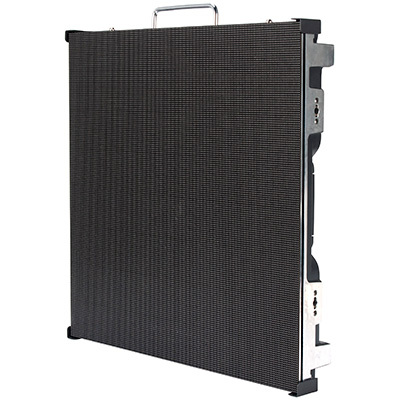 On both fixtures, an on-board 4-digit LED display screen (with four push buttons) allows selection of internal pre-sets and programs as well as DMX address configuration. 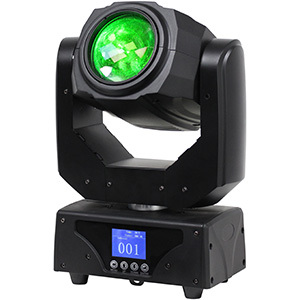 64 pre-set colour macros are provided, while an RGB+UV dimmer mode allows any colour to be chosen without the need for any additional control equipment. The units are also pre-programmed with a wide variety of animated colour changing patterns. 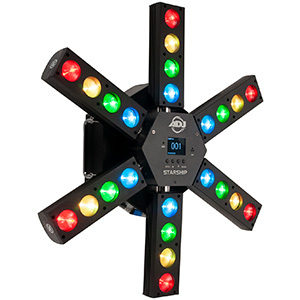 There are 16 Colour Change programs that offer energetic switches between different colours, which are ideal for illuminating dancing. In addition, there are also another 16 Colour Fade programs that offer a subtler effect that is ideal for providing the backdrop to the earlier portions of parties and events. All of these programs can be set to run at any speed and there is also a Sound Active Mode, with a choice of pre-programmed patterns, that allows colour changes triggered directly by the beat of the music. 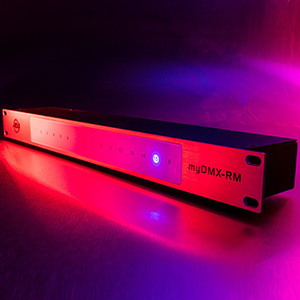 For use as part of a wider DMX-controlled system, both units offer a choice of different DMX modes, allowing for full remote control of all of the units’ features including individual RGB+UV colour mixing. 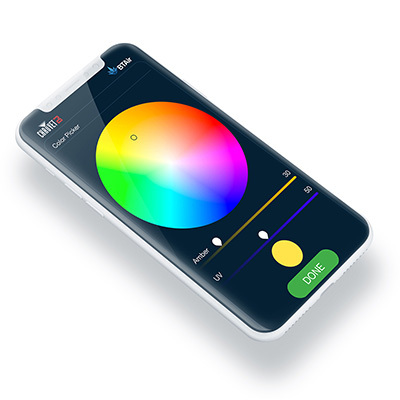 However, for users who want to be able to select colours remotely without the need to run out DMX control cables, wireless control options are also supported. The fixtures are compatible with ADJ’s UC IR wireless remote (sold separately) and can also be used with ADJ’s new Airstream IR app which allows remote colour and pattern selection, as well as dimming and strobing control, directly from an iPhone or iPad.